Nedap Identification Systems released Window Tag Ultimate, a battery-powered, long-range RFID tag specifically engineered to offer high-end performance and security features in vehicle identification applications. Since it can be read only for 5 seconds after easy manual activation, Window Tag Ultimate allows the driver to keep full control over tag ID reading operations. Additionally, besides being compatible with Nedap Identification Systems’ robust 2.45 GHz RFID protocol for vehicle identification, Window Tag Ultimat leverages a 433 MHz air interface protocol that features AES128 encryption to add an extra layer of security. This driver-activated high-security RFID tag for vehicle identification comes with a factory-programmed read-only memory, so that it is recommended for applications where only vehicle ID reading is required, for instance parking access management and gated communities. The device can be easily mounted on the interior side of vehicle’s windshield by means of an integrated suction cup and come in a compact and elegant form factor combined with anthracite color to match typical automotive interiors. Thanks to its battery-assisted technology, the read performance is excellent and the read range achieves 10m. Window Tag Ultimate is specifically designed for being used with Nedap Identification Systems’ TRANSIT Ultimate reader, but is compatible also with previous models of the TRANSIT series. The user replaceable AAA batteries offer an expected life-time of 5 years, depending on average climate conditions. The part number, tag ID number and date of manufacture are laser etched into the back case of the tag. Please contact Nedap Identification Systems for additional information on this driver-activated high-security RFID tag for vehicle identification. Are you looking for other kinds of RFID tags? Do try our RFID Tag Search Engine or contact us at info@veryfields.net, also for suggestions on complete RFID solutions. 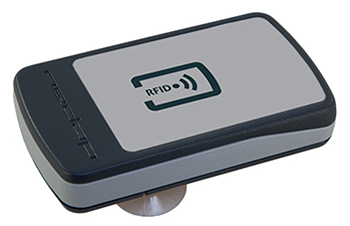 This entry was posted in RFID News, RFID tags and tagged Nedap Identification Systems. Bookmark the permalink.